A police dog in Coconut Creek, Florida was dismissed from the force this week after biting a doughnut shop employee. It wasn’t the first instance the dog had taken a bit out of something other than crime. The 4-year-old Belgian Malinois named Renzo had served with this southern Florida police department for a year and a half. Last November, Renzo bit another officer when his handler, 53-year-old Carl DiBlasi, tripped and lost control of the pooch during a night-time pursuit of a suspect. Officer Michael Giuttari, 26, suffered leg injuries. It was a far more serious incident earlier this month, however, that cost Renzo his job, the South Florida Sun-Sentinel daily reports. As DiBlasi and several other officers met at a Dunkin Donuts parking lot in the nearby town of Margate, Renzo leaped out of the police cruiser and attacked doughnut shop employee Robert Doherty. Coconut Creek Police Chief Michael J. Mann decided to “retire” the dog from law enforcement. Renzo will move in with Officer DiBlasi. Police dogs are taught to bite. 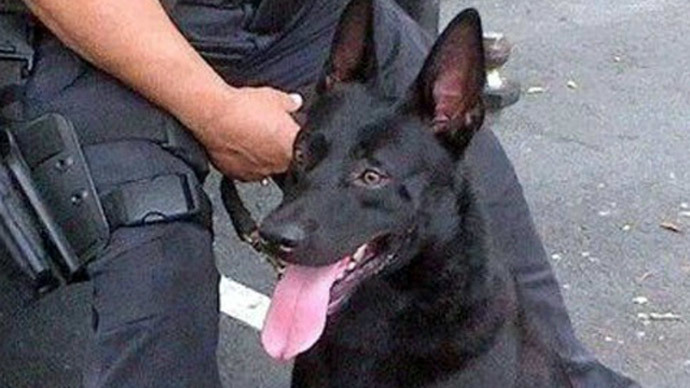 But a police dog is being kicked off the force for biting… A donut shop worker. Stand-up comics rejoice.